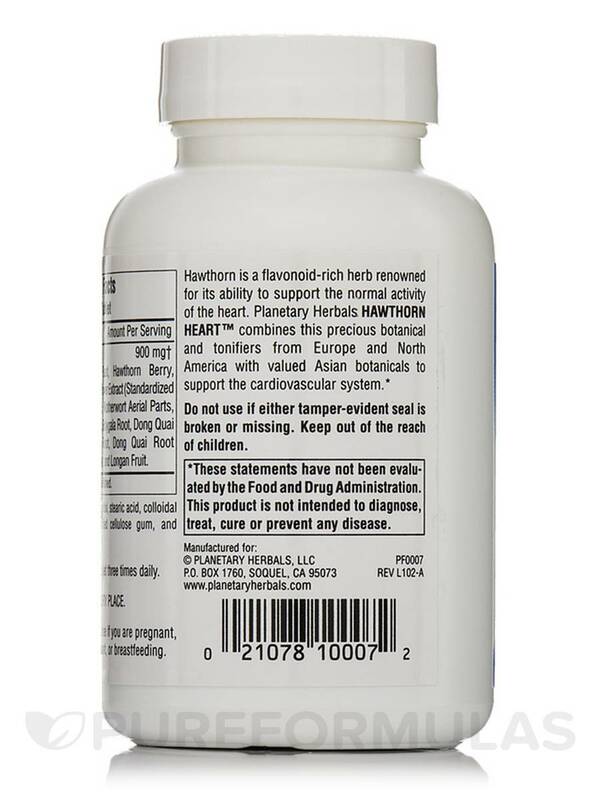 All the ingredients in Hawthorn Heart by Planetary Herbals are great for blood pressure. And tienchi ginseng hawthorn and polygala root are great for energy. 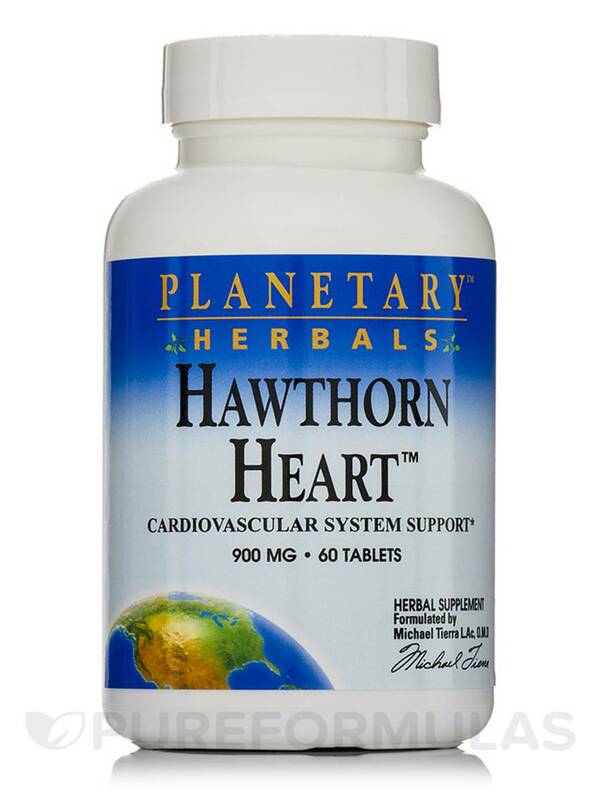 Hawthorn Heart™ 900 mg 60 Tablets from Planetary Herbals may help support the regular functioning of the heart‚ and may protect you from heart related conditions. A popular herb in America and Europe‚ Hawthorn is a thorny tree that bears white flowers and red berries. Indigenous folks believe that this plant may contain properties that could help the heart. It is believed that the herb may possess unique qualities that aid in improving efficiency of heartbeats and blood flow to the coronaries. The leaves‚ berries and fruits of the Hawthorn tree are found to be rich in crataegus acid‚ vitexin‚ quercetin‚ saponins‚ isorientin‚ catechins and isovitexins. These flavonoids are believed to have anti-oxidant qualities that may potentially decrease the risk of cardio-conditions and improve calcium assimilation in the bone cells. 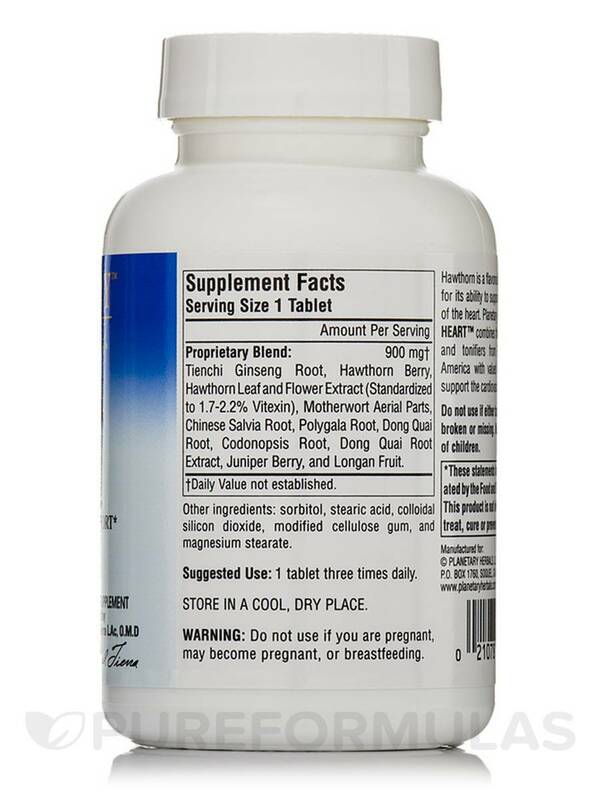 This Planetary Herbals supplement is specially formulated to include all the rich flavonoids of Hawthorn in the right concentrations. Apart from Hawthorne extracts‚ the formulation also includes rich Chinese herbs like tienchi ginseng root‚ Chinese salvia root‚ dong quai root extract (in 4:1 ratio)‚ longan fruit‚ polygala root‚ motherwort leaf‚ codonopsis root and juniper berry. If you wish to lead a ‘feeling-young-at-heart’ and stress-free life‚ then Hawthorn Heart™ 900 mg 60 Tablets from Planetary Herbals may be your perfect daily herbal supplement diet. Hawthorn Berry‚ Hawthorn Leaf and Flower Extract‚ Tienchi Ginseng Root‚ Polygala Root‚ Chinese Salvia Root‚ Dong Quai Root‚ Longan Fruit‚ Dong Quai Root Extract‚ and Juniper Berry. Sorbitol‚ stearic acid‚ silica‚ modified cellulose gum‚ and magnesium stearate.